To ensure the continued success of their businesses, while providing quality services and delivering affordable care that is improving the lives of patients, community pharmacists in the country must adapt to the evolution of the practice from mere dispensing and compounding drugs to patient-centered and outcome-oriented care. 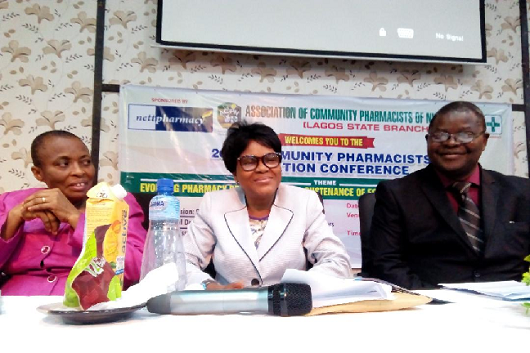 This was the submission of experts and scholars in the pharmaceutical industry, at the 2018 Lagos ACPN’s Pharmacists Continuing Education Conference, held last December at NECA House, Ikeja, Lagos. L-R :Prof. Cecilia Igwilo, chairman of the occasion; Prof. Bolajoko Aina, keynote speaker; and Pharm. Olabanji Benedict Obideyi, chairman, ACPN, Lagos State, at this year Continuing Education Conference. Those who spoke at the event included Pharm. (Mazi) Sam Ohuabunwa, president, Pharmaceutical Society of Nigeria (PSN); Prof. Bolajoko Aina, dean, Faculty of Pharmacy, University of Lagos (UNILAG); Prof. (Mrs) Cecilia Igwilo, distinguished professor of Pharmaceutics and pharmaceutical technology, Faculty of Pharmacy, UNILAG; and Pharm. 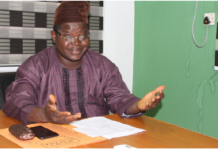 Samuel Adekola, national chairman, Association of Community Pharmacists of Nigeria (ACPN). According to the keynote speaker, Prof. Aina, the education conference was timely and apt, as knowledge gained would not only help community pharmacists to keep their businesses afloat, but also help them to make real changes in their practice pattern as they devise new revenue streams beyond dispensing medications. The university don, who delivered the paper, “Evolving Pharmacy Practice: Tool to Sustenance of Economic Recovery and Growth”, said that to survive, community pharmacists must be willing to acknowledge the rapidly occurring changes in healthcare delivery and accept the reality that the changes will continue, noting that the traditional roles and activities are no longer of much value. A cross section of community pharmacists at the event. According to her, Pharmacy is moving from being prescription-focused to being patient-focused; so the practitioners must change their mindset beyond just filling prescriptions and move on to a patient-centered view, where they are looking at all of the patient’s needs when they fill prescriptions. Speaking in the same vein, Prof. (Mrs) Cecilia Igwilo, who was the chairman of the occasion, noted that for pharmacists to survive in today’s world, they must be willing to accept the reality that Pharmacy is evolving and that the activities and practice of yesteryears are diminishing. She added further that the role of the pharmacist in community pharmacy is changing from a focus on preparation, dispensing and sale of medications to one in which the pharmacist assists the public to get the best possible result from medications through patient education, physician consultation and patient monitoring. In his goodwill message at the programme, Pharm. (Mazi) Sam Ohuabunwa, commended the Lagos State ACPN for the choice of theme for the programme, saying it was very much in consonance with the vision of his administration for Pharmacy. Also, the duo of Registrar, Pharmacists Council of Nigeria, (PCN), Pharm. N.A.E Mohammed; and National Chairman, ACPN, Pharm. Samuel Adekola, noted that the continuing education conference organised annually by Lagos ACPN has been consistent over the years because of the importance that the association places on knowledge and effective service delivery. In an earlier address, Chairman of ACPN Lagos, Pharm. 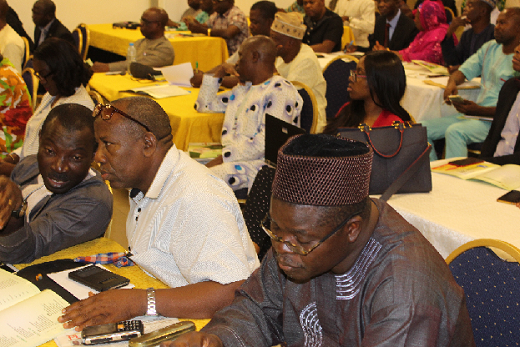 Olabanji Benedict Obideyi, said the continuing education conference was designed to ensure members of the association were not left out in the scheme of things, even as the world keeps developing every day. He also noted that the theme of the conference was timely, considering the wave of disruption being experienced in pharmaceutical practice, with community pharmacy considered the most affected. Previous articleHow Committed Are You?